Honestly this will live or die for me based on the sourcebooks, as I don't find tabletop RPGs all that fun to play. I'd love to see them flesh out the cultures outwith the Old World, and they have the option to dip into "the past" to avoid rehashing things - a version set during the Time of Three Emperors/Mordheim sort of era would be awesome and give them a lot more room for maneuver. Of course the best thing would be if they put out material heavily implying that the End Times never happened and AoS is actually some kind of alternate reality thing then simply carried on developing the WHF setting, but I doubt GW would let them get away with that even if they wanted to. a version set during the Time of Three Emperors/Mordheim sort of era would be awesome and give them a lot more room for maneuver. A battle game of blocks of troops, and a skirmish campaign game of small warbands set during this time would likewise be awesome. I think that the fact that they'll be using the D100 mechanic says everything. Love it or hate it, the first two editions of WFRP were massively popular and are still recieving a lot of support from fans all across the world. In Poland we even have a huge reprint of all the books right now. 3rd edition was very ambitious, but in the end it was a failure. It was a boardgame, which pretended to be a RPG, and it did not worked. The fiddly dice mechanic, the "stances", the fact that every square inch of the table was clustered with dice, cards, sheets and so on - WFRP 3ed died pretty quickly and if you look at it, there haven't been that many supplements released for the game. The last few were print-on-demand, showing just how much WFRP 3ed had failed. It's kinda sad really, especially if you consider the fact that this game was a test ground for Shades of the Empire, FFG's premiere Star Wars RPG, which is really, really good. You could argue that because it was a test ground, the star wars RPG turned out well. As in, better they make mistakes there, because people can keep using 1st or 2nd edition. Whereas the Star Wars RPG perhaps didn't have as much to fall back on. Yeah, I'm glad that the SW RPG turned out well. I'm just angry that they've used WFRP as a guinea pig. There are two Star Wars RPG's before the FFG one: 1987 (d6) and 2000 (d20). So pretty similar to WFR 3th ed, if anybody wanted to fall back on earlier styles of rules. The D6 Star Wars system was/is my favourite RP system of all time. I wish I was still running adventures. I wrote a good few scenarios for that, and built many a vehicle. 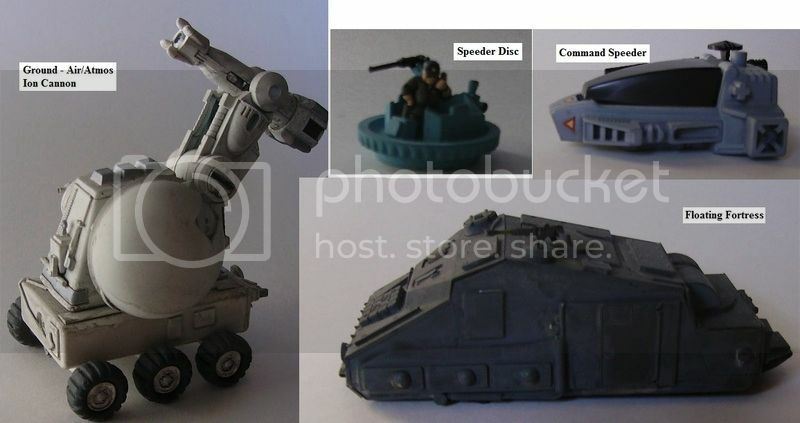 I found some old pics of some of my versions of various Imperial vehicles - either my own invention or my scratchbuilt version of vehicles in the source books. 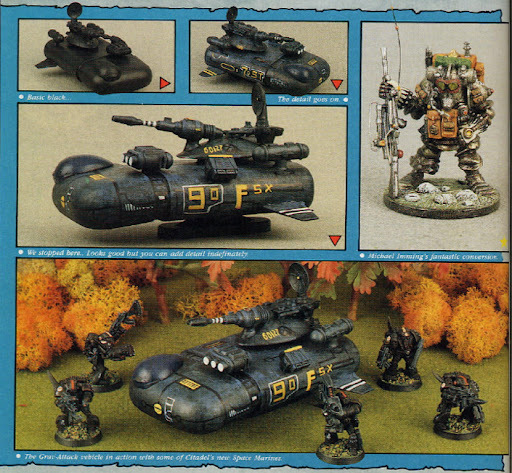 I did everything 15mm scale, except for space battles - for those I used the little toy ships you used to get in chocolate eggs, as well as cheap little converted toys. These pics are not 'to scale'. Wow, these look really impressive. They're all DIY? Cool! The command speeder isn't DIY - it's a cheapo children's pound shop toy. But break some bits off and paint it up, looks fine. I wish I had pictures of my spaceships - made from toy walkie talkies, shower gel bottles, and one is a kit bash amalgamation of a real world space-shuttle and a Space 1999 ship! I still have boxes and boxes of plastic junk awaiting 'future projects'. Still, can't complain, as I am busy with my WFB campaign projects instead! Oh man, so much nostalgia. Would love to some of your toys Padre. I think the D6 Star Wars was the one I played years back in my university days. If that's the Keith Baker, Bill Slaviksec version, then yeah, I really enjoyed that. I don't think I've played any later edition of Star Wars. I am happy that WFRP 4 is using the D100 system. As a GM it's very easy to explain to new users. And 2nd ed is the system I've been running in a weekly game for the last 8 months on roll20. For me the percentile system and stats and the careers are what gives WFRP it's flavour. It's pretty easy to translate 1st ed scenarios, though I play in a pre Storm of Chaos version of 2nd. Mainly because it's more in line with the WFB setting that has been around since 4th ed WFB in the early 90's which sort of retconned or invalidated a lot of WFRP1 stuff. There are things that I would possibly like to see done differently, or improved. I hope there is a forum set up on Cubicle 7's website soon so that we can possibly influence things a little but it will be well into development by now. I'd make a couple of changes at character creation. Being able to roll for the stat values, plus a couple extra, then assigning the best of those stat rolls to your favoured stats, instead of rolling each stat and being stuck with it. Even with Shallya's mercy in 2nd, no player I've played with has ever liked playing a character they know is below average. Also I think they way buying equipment is done with the various is fine, but it involves a lot of rolling for each item and for each quality. It would be better to roll to see if a particular type of trader was available, then that unlocks a range of items. Having played using Roll20 for the last 6 months, I hope cubicle 7 has support for a character sheet and things for the game on there. In my group we actually allow to assign roll values to each stat. This way the characters make more sense. I hope that they'll actually put more emphasis on social and economic aspect of the 4th edition. In 2nd these things were kinda marginalised. There are 8 stats, I've let my group roll for 10 stats, and assign the best 8, and if need by do a Shallya's mercy on another. At the end of big adventures where they could gain a fate point, I don't let the max go above 3, so I give them the option of another Shallya's mercy. I also hope they don't do a lot of re-hashing and re-working old material. Much as I love the classic Enemy Within (up to PBTT) I don't want to see it re-printed for 4th, at least not without bringing it in line with the WFB setting pre-Storm of Chaos, Pre-End Times. I have so many re-prints of stuff like Rough Night at the Three Feathers and The Haunting Horror, and one offs in both 1st ed and 2nd ed books. I'd like to see new adventures, interspersed with setting books, but not necessarily City of the White Wolf. Something in that much detail for Altdorf welcome. Arguably I'm looking forward to the Age of Sigmar RPG more though. For it will do the job 1st edition WFRP did, and flesh out the mortal realms into a living setting. I definetly agree on the reprinting thing. TEW, while a great campaign (I'm DM'ing it right now) should be put to rest. Seriously. I want to see different campaigns in different places and time periods, like you've mentioned yourself Oxycutor. I think that the Age of the Three Emperors and the Skaven and Vampire wars would be a great source material for some cool stories. I'm actually waiting for the AoS RPG as well. I hope that it will actually make this setting interesting and more relatable, going beyond the "war, war, war" thing that it has right now. I will definetly try this game out. BTW "Rough night at the Three Feathers" was awesome. DM'ed it twice. Good stuff. Eww of Sigmar RPG will only take time and resources away from the original Warhammer Roleplaying Game. Afterall for it, it already exists Manual of Planes. First edition too, from what I understand. That's a good deal! Cool, I'll buy these, not much faith in the new wfrp setting. It'll be set in the times of The Enemy Within. I'm optimistic. Wow, that's a great deal on the pdf books, definitely getting those. I think wfrp 3e is the most intriguing game I'll probably never get around to playing. I've played a lot of FFG Star Wars, and like the way the dice system evolved into that, but the game just seems overly complicated. It almost feels as though they went to some of their board game designers and said "Can you make a warhammer roleplaying game", then the board game designers replied "Sure! Whats a roleplaying game?" Then after five minutes of explanation wfrp 3e was born. I'd be interested in trying it, but it just seems easier to play 2e. Hopefully 4e will be good, I want more Old World lore! I'll also agree with the comments that an Age of Sigmar RPG could work. The setting as it stands isn't that interesting, but it does have potential, and an RPG could be just the thing to explore some of that potential. I think that the "board game feel" was what killed the 3rd edition. You're right about to overcomplication, not to mention really high price tag for the books. I honestly think that AoS RPG might be good. I also hope that it'll be able to convince me on giving the Age of Sigmar another chance. For those who've gotten humble book bundles, what format do they come in? It says multiple format PDF, so I should be able to play it pretty easily right? I don't have any ebook readers, just good old adobe.